In this second part dedicated to photo equipment you need to realize panoramic photographies by stitching, we'll review more specific equipment. 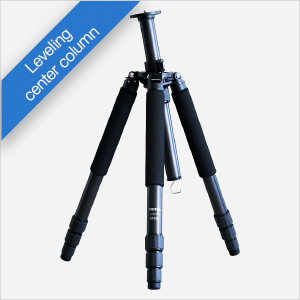 I'm talking about the photo tripod and the telescopic pole. In the next page, we'll talk about a very useful particularity it can have and finally about levelling bases, so convenient to save time because levelling the panoramic head is almost essential. The process of shooting mentioned in the first page makes using a tripod almost essential when you want to be rigorous, hence productive. It is one thing to manage to stitch a panorama correctly and it's a different thing to make several "easily". The framings and focusing will be even more accurate. It's the most stable solution. Any tripod can be fine, of course, but it can also be useful to place it very close to the floor in certain cases or even at an important height (photo here on the right) - it's less common though because a height of 1.50 m seems very interesting to me... see preparatives - and finally as stable as possible, above all in the particular case of the realization of a gigapixel panorama. In many cases you'll just make it work! For their settings possibilities and their value for money, Manfrotto, Benro tripods are very interesting and for their quality only, Gitzo carbon tripods are among marvelous tools because light and rigid. It's interesting to note that there's a new generation of tripods which central column can be slightly tilted, like on the models Gitzo LVL or by adding a special column to Manfrotto - 555B and 556B -. It appears to be especially convenient when levelling the panoramic head because 15° of tilting in all directions enable to fix almost any situation in one screw movement. See below. Feisol really makes very good carbon tripods, very light and yet stable enough and they also possess what I find most convenient to quickly level a panoramic head, a central column that tilts on about 10°, as on the famous Leveling Gitzo... 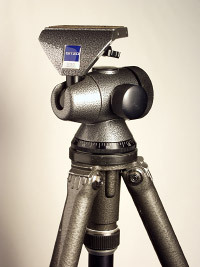 But unlike Gitzo, Feisol offers a tripod that would be the equivalent of a serial 3. My note : 10/10 - I love these tripods that I use to realize my virtual tours for ten years. They are light, absorb very well vibration and the reclining column is so convenient! Unless it's about realizing a panorama in height, with a telescopic pole. With lots of carbon tripods now on the market, light and not too expensive, this shooting mode is expanding. 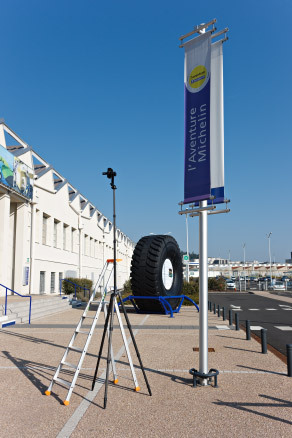 It will then be easy to make monorange panoramas at a height of more than 6m without heavy installation to set up. It prevents of course long exposure times but when technically the photos can be shot, the point of view of the panorama. 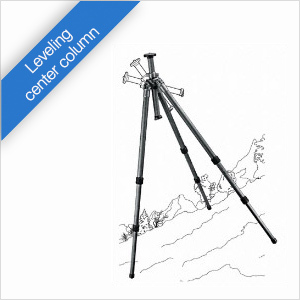 As for now, one telescopic pole stands out: the carbon pole Nodal Ninja Series 2 . It is light to carry, not too long once folded, very well made and designed... a true revolution, very pleasant to use. There are many variants to reach different heights. So you have to do your market according to your needs. Lightweight: less than 2 kg! Excellent value for money to discover another world, perched at 6 m high! 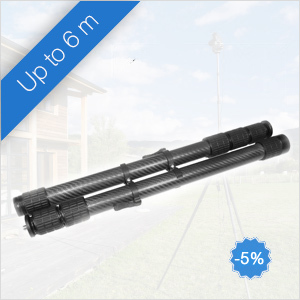 * Price without accessories - You'll need to add the base, the carrying case, the rotator hence about 180.00 € more.